Any method that improves the ability to forecast technology change is potentially very useful. The challenge is that innovation is the ultimate in new. Innovation is often unanticipated. It would seem that technology progress is beyond the reach of forecasting. There are several laws for modeling technological improvement. Many analysts have used Moore’s law and Wright’s law. Each provides single point predictions about technology performance and cost. Swanson’s law is another tool for single point estimates. 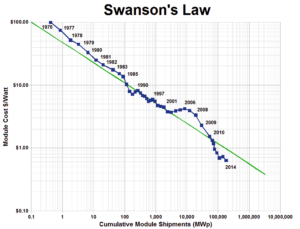 Swanson’s law states that solar PV modules prices will drop 20% for every doubling of cumulative shipped volume. Hence, module costs would drop 50% about every 10 years. 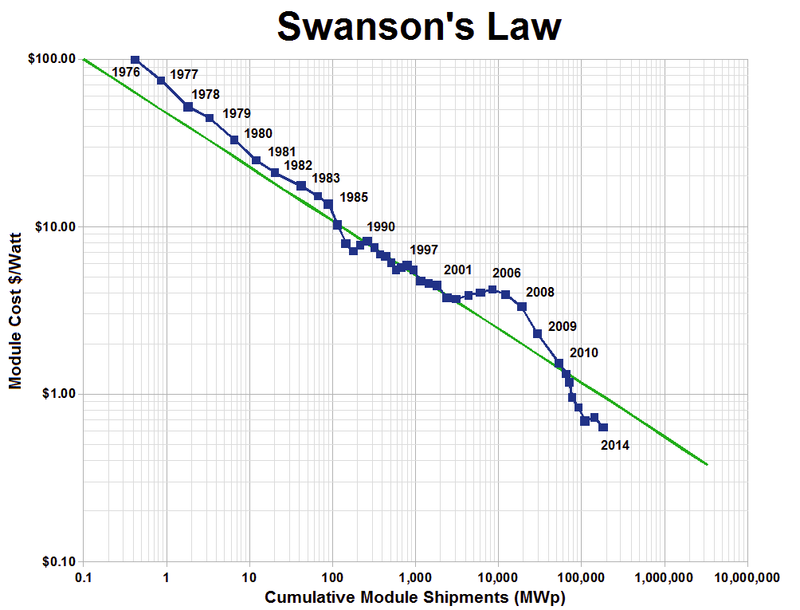 Wright’s law, Moore’s law and Swanson’s law have been instrumental in the past. 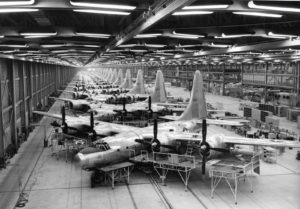 They have all served as guides for technology progress, commercial strategy, and large-scale investing. Often, they define a path that seems almost too optimistic. Wright’s law, for example, predicted the potential to scale up production of US airplanes in WWII. That potential was first greeted with disbelief, but was proved true and had critical impact on the outcome of the war. Moore’s law has also been used to justify large investments to scale up production of CPUs, LCD TVs, smart phones, and lithium batteries. But what exactly are these methods? How well do the methods work? And what do they say about innovation in the energy markets? 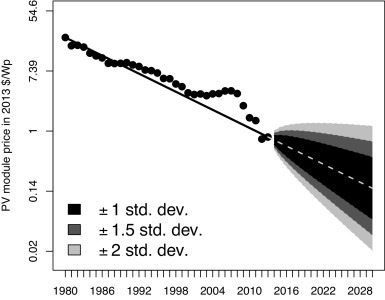 Wright’s law and Moore’s law both provide single point estimates of cost or performance. 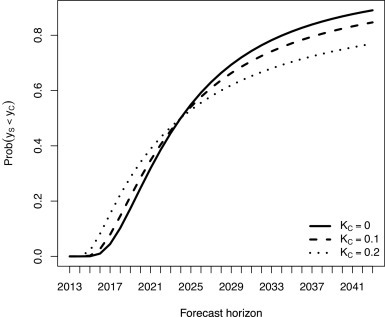 There are several papers that test the accuracy single point technological forecasts. Multiple authors confirm that point forecasts for innovation have limited value. The authors point out that the model risk is often too large. They even warn that single point forecasts can be dangerous if taken too seriously. Finally, the papers conclude that a distribution forecast is needed to estimates the likelihood of different innovation outcomes. The image at left shows the forecast distribution of estimated prices for solar PV. The Farmer and Lafond model is used to predict module prices through 2030 The range of two standard deviations in the figure are 95% prediction intervals. Another value of the model is to compare innovation across multiple markets. Farmer and Lafond compute the probability that solar power will be less expensive than coal generation. Farmer and Lafrond plot the probability as a function of time. 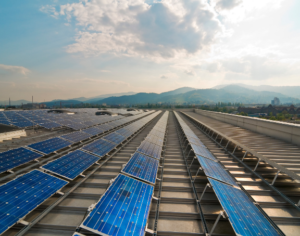 They assume that solar must compete today with coal generation, which is roughly a third that of solar. The estimate also assumes that coal prices, on average, are not likely to drop significantly. The probability chart has a surprising conclusion. 2024 is a pivotal year where solar has a 50% chance for price parity with coal. The three lines compare different degrees of uncertainty. The crossing point for price parity is the same in all 3 cases. In addition to price, it is essential to forecast solar’s production potential for strategic planning and investing. The current business context of solar production is simple: Over the last ten years cumulative installed capacity of PV has grown at an impressive rate. According to BP’s World Energy Review 2015, solar energy as a whole grew at an annual rate of 42.5% during the period from 1983-2014 . In 2015, solar generation represented only 1.1% of total primary energy consumption. In comparison, total energy consumption has grown at 2.3% between 1965 and 2015. 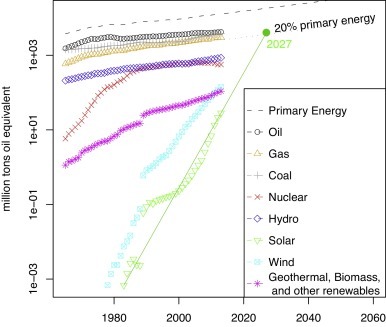 Farmer and Lafond extrapolate the relative growth of solar and other energy sources over 10 years, and their prediction are again most noteworthy. Second, solar energy could achieve volume parity with oil in ten years, while surpassing contributions by natural gas, coal and nuclear. Disbelief? Maybe. Disbelief may also explain the low predictions for solar by such diverse entities as BP, the IEA and Greenpeace…they all have underestimated the rate of innovation in solar. Meanwhile, when confronted by the appearance of the first digital camera, a spokesman for Kodak respond with great confidence in their film and camera franchise. Disbelief may explain why Kodak’s technology, market share and financial viability were all lost….in less than 10 years. This entry was posted in Economics, Modeling. Bookmark the permalink.